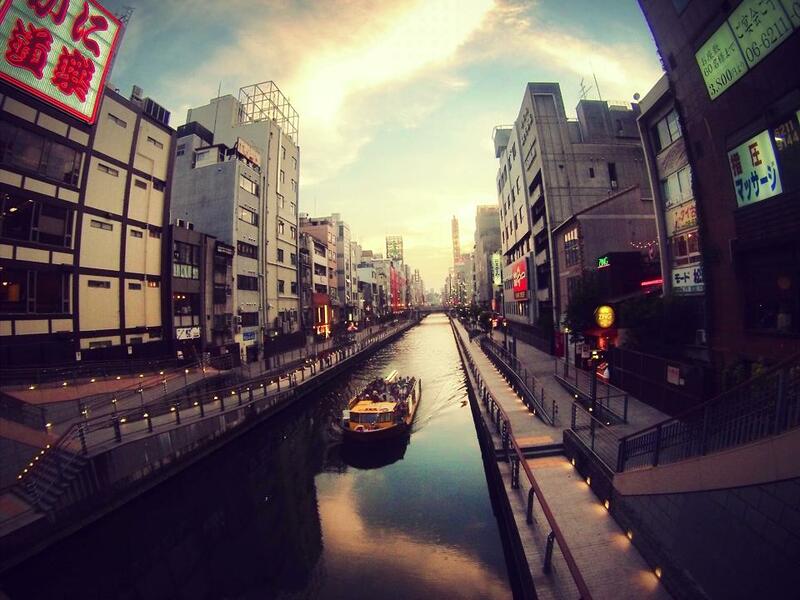 Osaka is one of our favorite cities in Japan. It has amazing architecture, vibrant nightlife, shopping, and abundant street food that will make your mouth water! 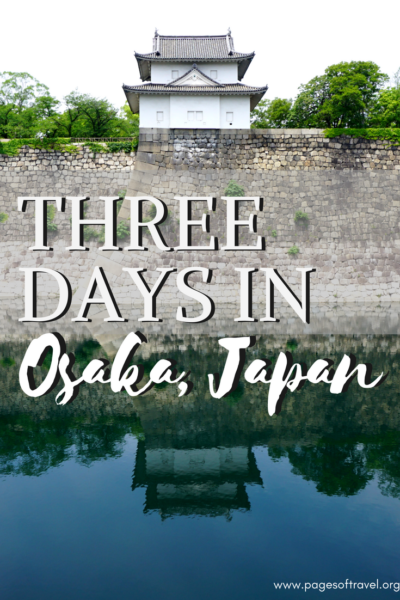 This 3 day Osaka Itinerary will take you to the highlights of Osaka and introduce you to the many terrific dining experiences that are in Dotonbori and other areas of Osaka too! Read on to see why this city of neon has stolen our hearts! Disclaimer: This post contains affiliate links which we may make commission from. As always, we only recommend places and products we love! Our room at Kaneyoshi Ryokan was perfect for our first experience in a budget-friendly Japanese ryokan. The room itself had tatami mats and traditional futons to sleep on. Our room also had a traditional table, TV, air conditioning, and a sitting room. The sitting room has two western style chairs, a small table, a mini-fridge, and a fantastic view of the canal. While Kaneyoshi Ryokan has smaller rooms with shared bathrooms, our room had an attached private bath with a shower/tub combo. Kaneyoshi has a curfew at 1 AM, and you won’t be allowed into your room if you arrive later than that time. You also have to leave your room key at the front desk every time you leave. A big perk of Kaneyoshi Ryokan is how close it is to Dotonbori, and that there is a 7-Eleven practically next door. The Hotel Brighton City Osaka is a bit farther from the main areas of the city like Dotonbori, but it’s a great location for those who want to stay in an area that is a bit quieter but still very close to public transportation. There are also two convenience stores across the street from the hotel and a grocery store inside the nearby station which we utilized to get breakfast items, drinks, and snacks during this 3 day Osaka itinerary. The first stop on this Osaka itinerary is Sumiyoshi-taisha. 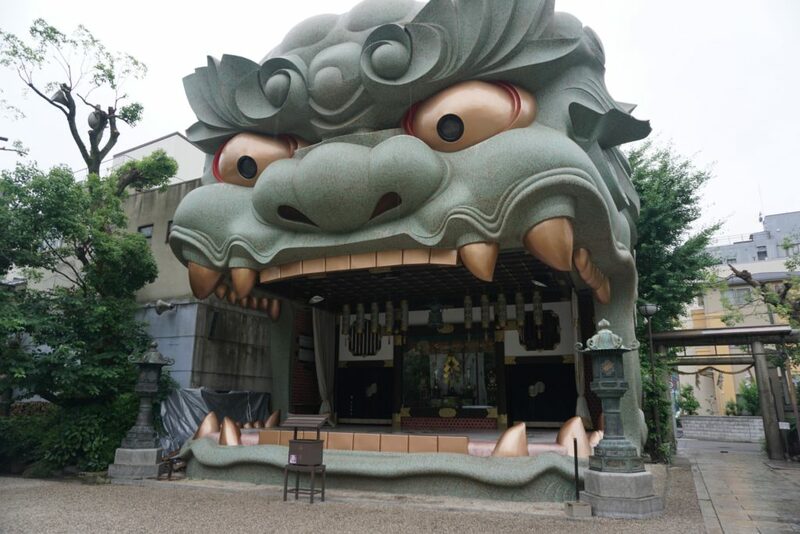 Sumiyoshi-taisha is one of the oldest and largest shrines in Japan which also makes it one of the most visited. 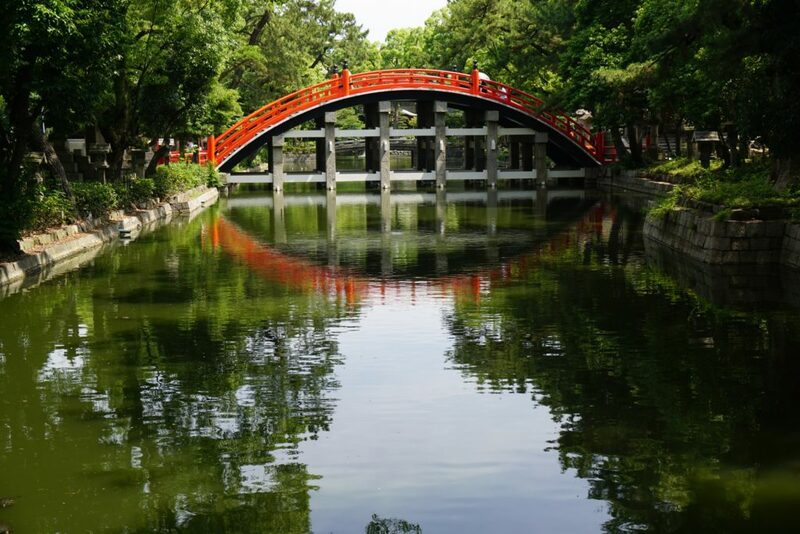 Sumiyoshi Taisha is best known for the beautiful orange bridge and water features. Since it is a little farther away from other attractions in Osaka, we recommend visiting it during the morning. 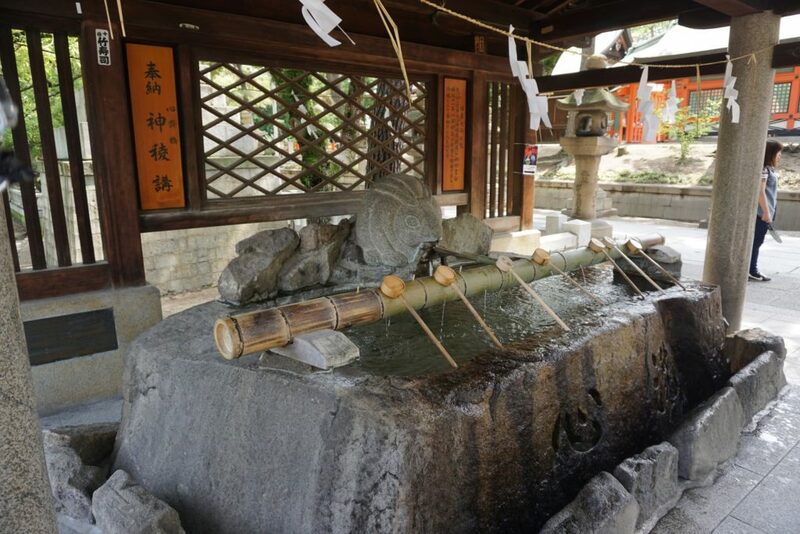 Before entering each shrine/temple it is preferred that you cleanse your hands. 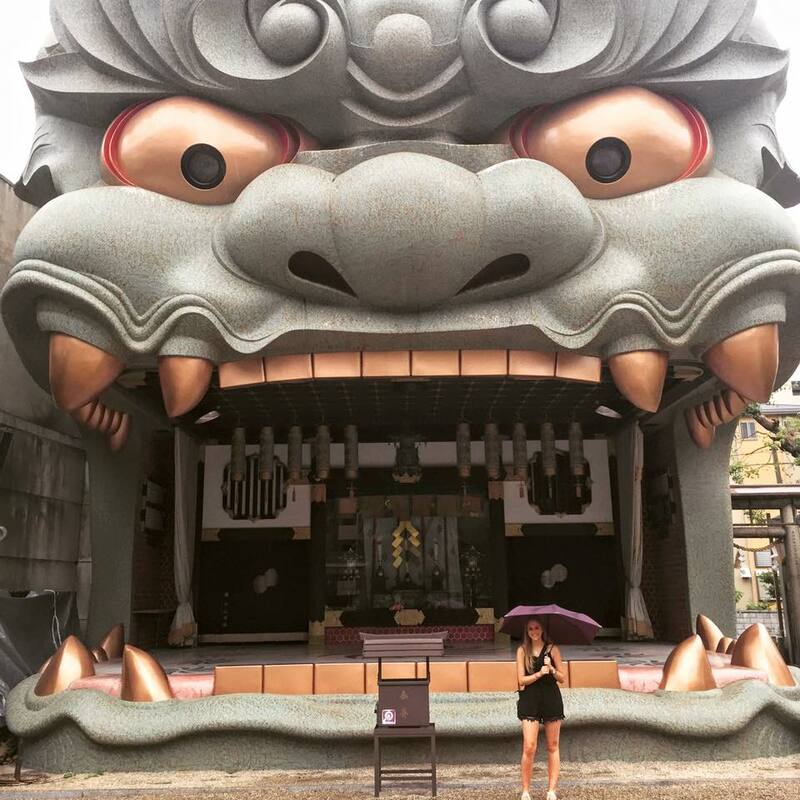 After visiting Sumiyoshi Taisha we headed back into the city to take on Den Den Town. Den Den Town is similar to Tokyo’s Akihabara shopping area. It is a haven for those who enjoy anime or manga paraphernalia and all sorts of electronic items like cameras and computers. But even if you aren’t interested in any of those items it’s still really fun to look around while during your 3 day Osaka itinerary! By now you’ll probably be pretty hungry for lunch (I know we were!) so it’s time to enjoy some of the infamous Osaka street food. Kuromon Market is a lively food market know as “Osaka’s kitchen.” Pop in and pick a stall to have your food freshly prepared right in front of you. We enjoyed some grilled king crab (it was only 100 yen! ), barbecued eel, yakisoba, grilled dango, and strawberry daifuku. The nice thing about this market is there are places to sit down as it is not common to walk and eat in Japan. 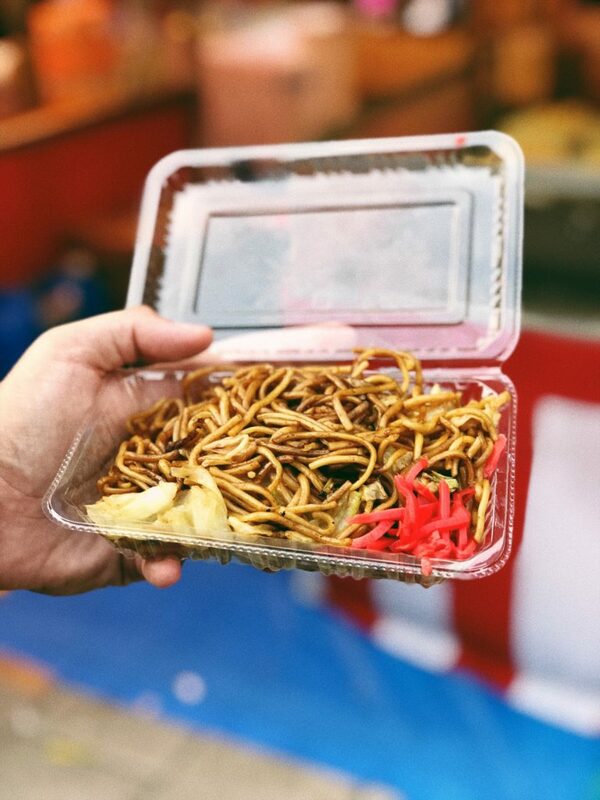 It’s also perfect for those who are trying to do Osaka on a budget because all of the street food is relatively inexpensive! 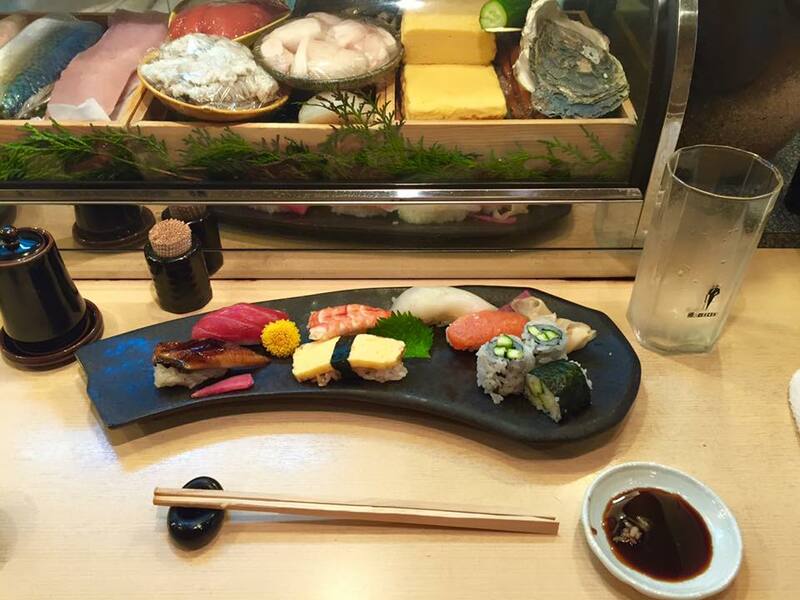 Osaka is called the “Kitchen of the World” and for a rather terrific reason. 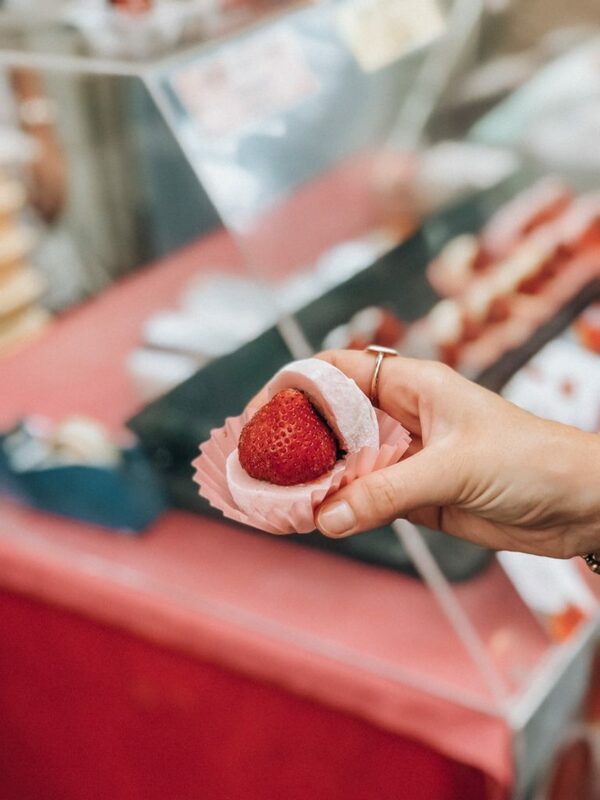 Chefs from all around the globe come to Sennichimae Doguyasuji Shopping Street to find professional tools such as cookware, the best Japanese chef knives, and to visit the food markets. We loved seeing all of the different bowls, plates, tea sets, and of course, the fun plastic food items that are often seen in the windows of restaurants. 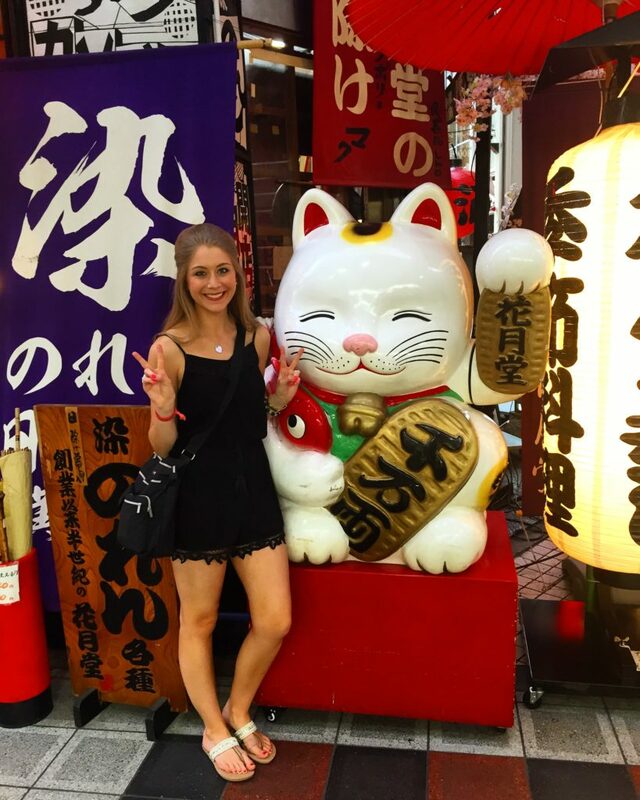 I couldn’t help but snag a photo with this maneki-neko! After doing a little shopping and eating you’re on to your next shrine on this 3 day Osaka itinerary! 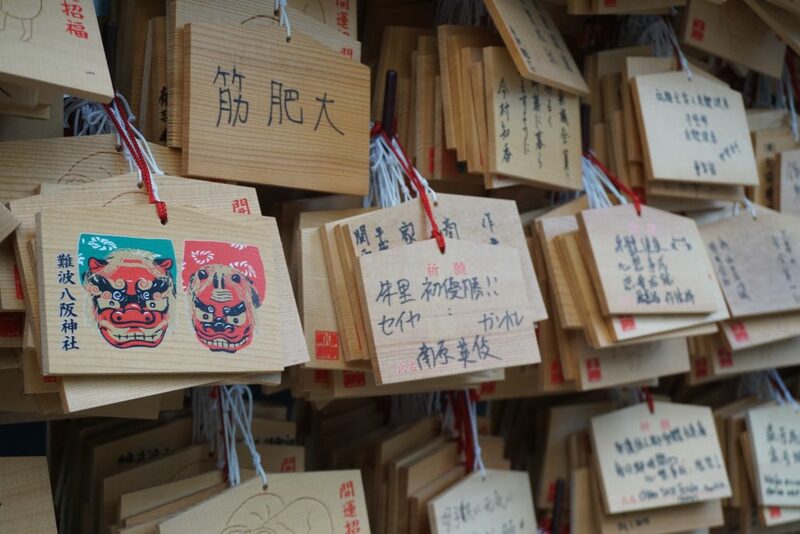 While most shrines in Japan have similar features, Namba Yasaka Shrine has a unique sense of retro nostalgia and far different from what we expected. It is believed that the lion’s mouth swallows evil spirits and brings good luck. Namba Yasaka Shrine was so much bigger than we expected! 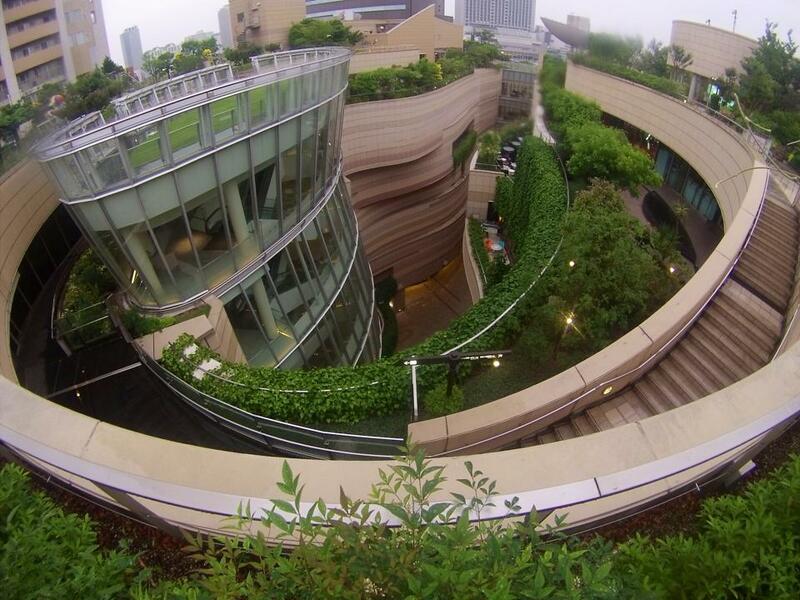 Namba Parks is a beautiful architectural shopping mall that features over 200 stores and has romantic gardens on the top floors for viewing. The stores are really fun to stop in but if you aren’t looking for more shopping head to the top to see the gardens and on a nice day lay in the grass while looking up at the sky. It’s the perfect place to relax! On our first trip to Osaka, we found Tsurutontan Soemoncho, a small shop that makes some of the best udon dishes that we had while in Japan. Not to mention that you can get a double or triple order of noodles for no extra cost! The location for this restaurant is right on the canal in Dotonbori so before or after getting dinner make sure you enjoy the sunset on the bridge outside. 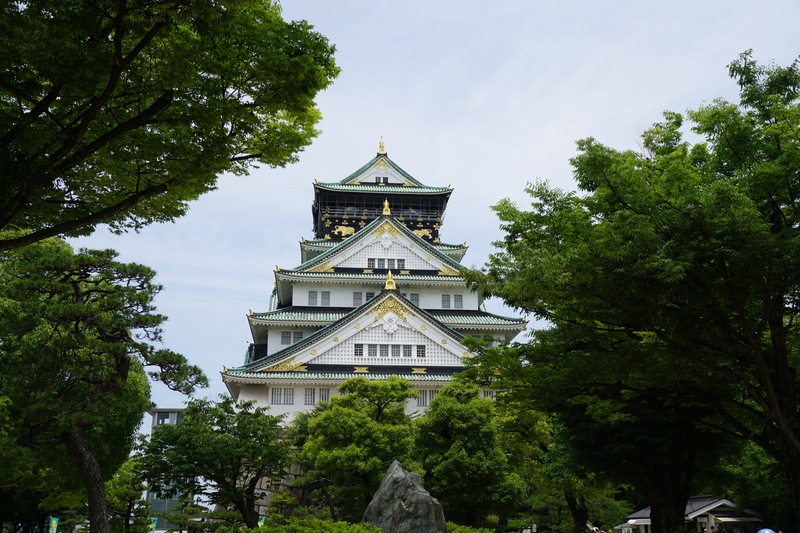 Osaka Castle is one place you cannot miss on this 3 day Osaka itinerary. It is truly marvelous and the park it is located in makes it even more beautiful. Although Osaka Castle is beautiful to view from the outside, it’s just as interesting on the inside too. When you first go in you’ll notice that it has been preserved in many ways but also remodeled into a museum with a number of artifacts and interesting pieces of history. We spent at least an hour here reading as much as we could about Osaka Castle. After our visit to the castle, we stopped by one of the many food stands and small shops that are in the park. In the spring, KemaSakuranomiya Park is known for its 5,000 cherry blossom trees! Osaka Castle is simply beautiful! A view of the water surrounding the castle. 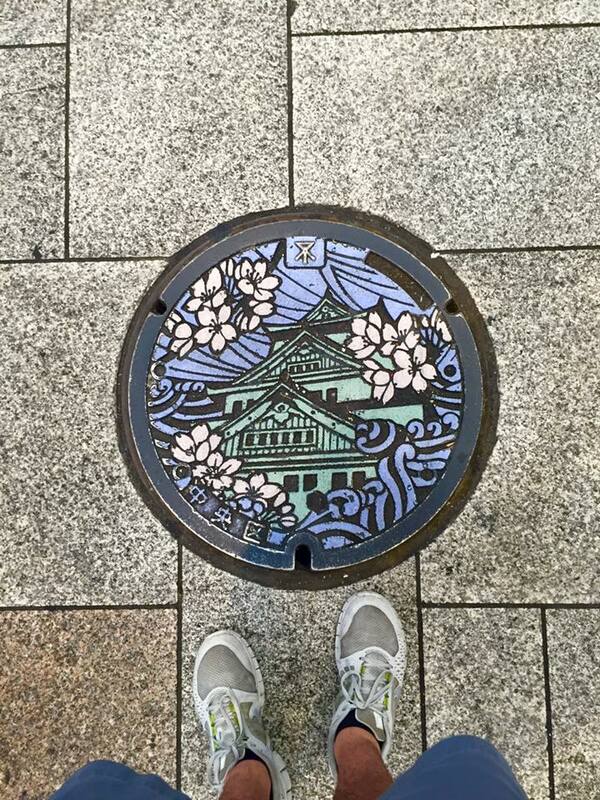 One thing we noticed in each city we visited in Japan is the drainage covers. Often they have intricate designs and are very colorful. This one is near Osaka Castle. For lunch today we recommend trying fresh sushi from a small, family-owned shop. They have an a la carte menu for those who want to pick their own sushi but we enjoyed a chef’s special which contained eel, tuna, shrimp, salmon, squid, tamago (egg), and some cucumber rolls for a finishing touch. All of the fish was fresh and delicious! Since Sushi Hayata is an incredibly small establishment so it’s best to arrive early to make sure you can get a seat! Shinsaibashi is the neighborhood close to Dotonbori that is known for its tax-free shopping stores from high-end fashion to mid-range items as well. A few of the stores we recommend visiting are GU, UNIQLO, Forever 21, and H&M. The first two being Japanese brands and the latter two, of course, being more western but they’re fascinating to see inside because they are 3-5 floors! 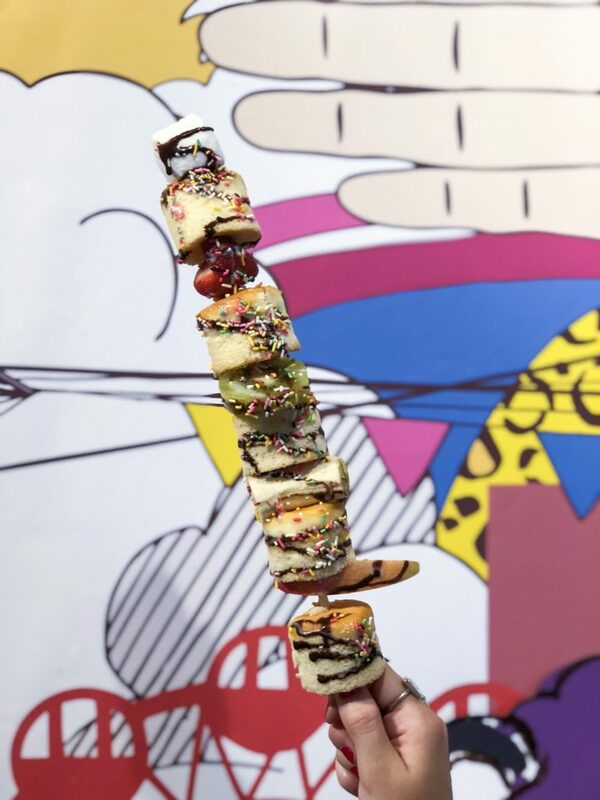 If you are looking for a sweet treat during your Osaka trip itinerary, PANBO has a skewer of mini pancakes interchanged with fruit and marshmallows. The best part is you can put on as many toppings as you want, say hello chocolate syrup and sprinkles! We got one of the smaller skewers but you can get them much bigger! 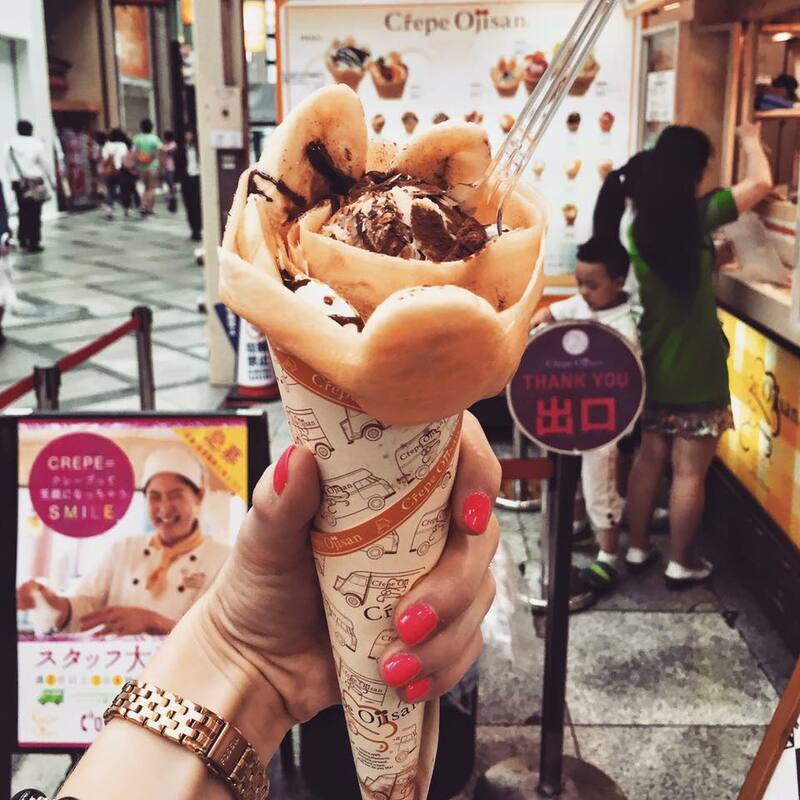 Another sweet treat option to get in Shinsaibashi is a crepe from Crepe Ojisan. The menu might be overwhelming but we can guarantee that you’ll be satisfied with whichever crepe you choose. We shared a banana chocolate crepe that had vanilla ice cream, cocoa powder, chocolate syrup, and banana slices. There is something so alluring about Dotonbori. Maybe it’s the neon lights, the smell of street food, the infamous neon Glico man sign, or the charming sunsets over the canals. Who are we kidding? It’s all of it. We love Dotonbori so much that we found ourselves here almost every evening. We loved the hustle and bustle of these busy streets, not to mention there are so many street foods to eat in Osaka! 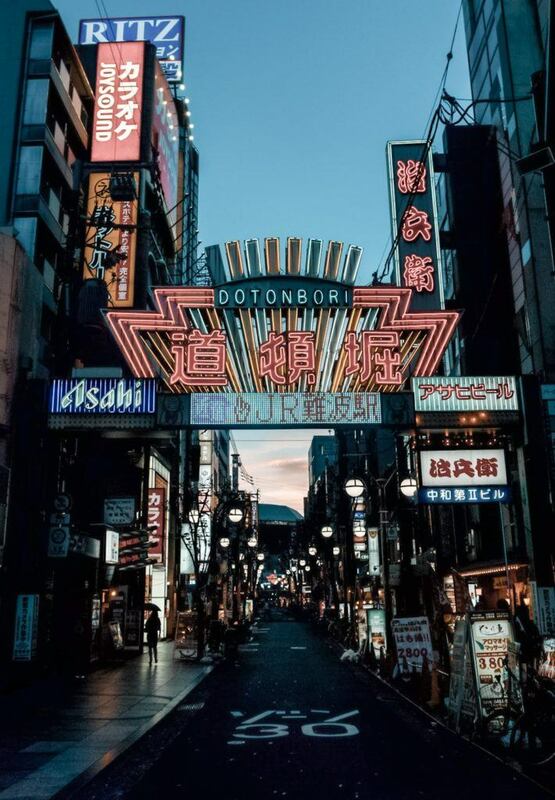 We love all the neon signs in Osaka! After taking in the sights and doing some shopping pick a spot to eat! You can do this in a few different ways. 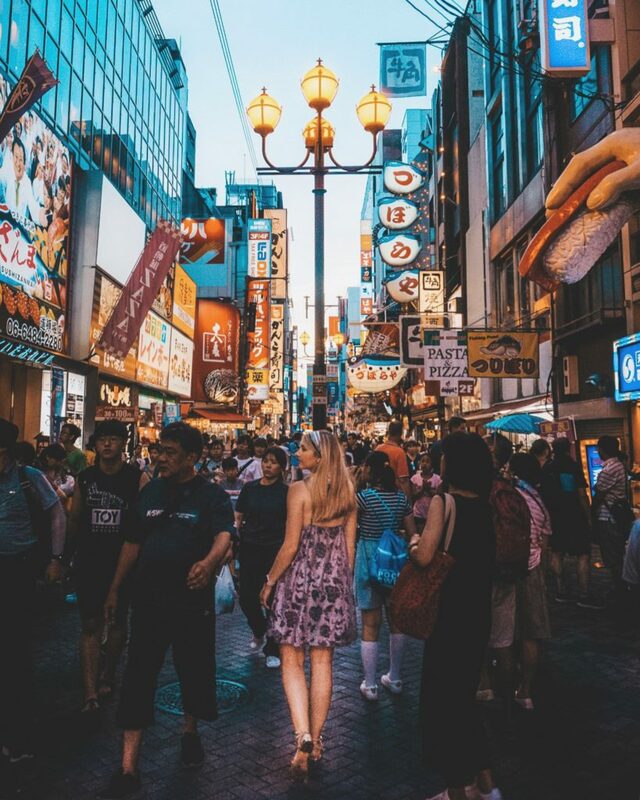 One, you can try a sampling of all the different Dotonbori street food by visiting different food stalls or two, by picking a specific restaurant to dine at. 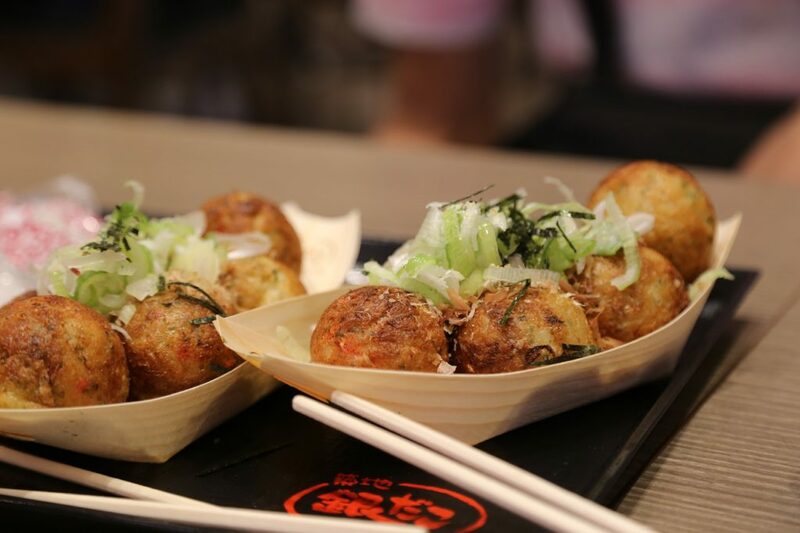 Whichever route you take we recommend saving room for some takoyaki, a ball of fried octopus that is a specialty of this area. Another thing to note is that you’ll often see MASSIVE lines outside of restaurants in Dotonbori. Some of these lines are because the restaurant is really popular, but others are just mob mentality. Don’t feel like you have to wait in an hour-long line if you’re really hungry. There are plenty of excellent places to eat. Walking through the crowded streets of Dotonbori. Tsurutontan Soemoncho: If you’ve been following this 3 day Osaka itinerary then you probably already ate at one of our favorite udon shops, Tsurutontan Soemoncho. But if not, this place is amazing! It has enough seating to accommodate a family and a variety of menu options including steak, sushi, and noodle dishes. 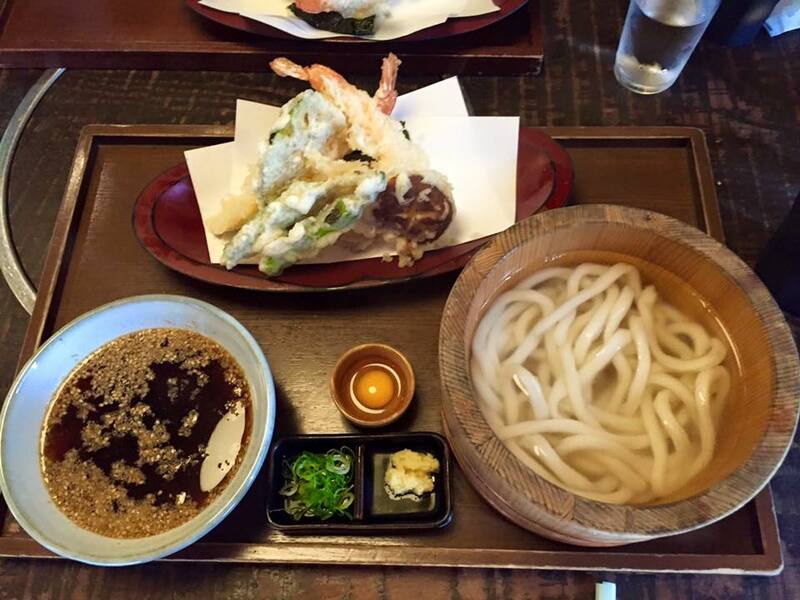 We highly recommend their udon because it is perfectly chewy and savory. Plus you can get a single, double, or triple order for no extra charge. Ichiran Dotonbori Honkan or Kinryu Ramen Dotonbori are two popular ramen shops in the dotonbori area. Ichiran is a well-known chain that has a creamy soup broth and thin ramen noodles whereas Kinryu has a soy sauce based broth and a variety of toppings. Creo-Ru: You can choose to dine at the restaurant inside but if you are wanting to try some takoyaki grab a spot in line at the food stall outside of the restaurant. The queue is usually long but the line moves pretty quickly. Matsuzakagyu Yakiniku M, Hozenji Yokocho: This restaurant that offers unique culinary experiences where you can cook your own steak and choose your own cuts of Matsuzaka beef. It’s not cheap but if you’re wanting to try some of Japan’s finest steak, this is a meal worth savoring. Kaiyukan is one of the largest and most impressive aquariums in Japan. Marine life is in 15 different tanks representing different areas of the Pacific Rim. 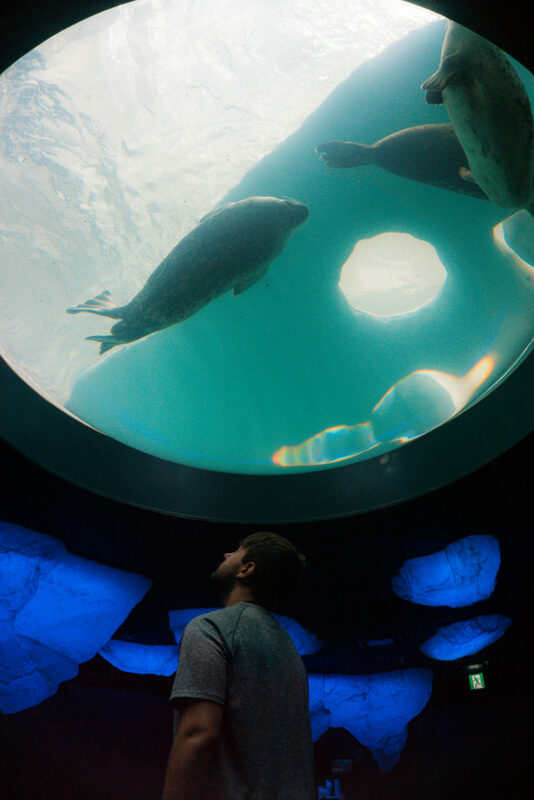 You’ll start your journey on the top floor making your way down a spiraling ramp while gazing at beautiful marine mammals. We recommend buying tickets ahead of time on their website so you can immediately go in the aquarium rather than wait in line to buy tickets. Be sure to account for travel time as well because it can be a 30-60 minute train ride depending on your hotel. Cost: 2,300 yen/adults (age 16+), 2,000yen/adults (age 60+), 1,200 yen/child (ages 7-15), 600 yen/child (ages 4-6), children under 3 are free. Kushikatsu is skewers of meat and veggies that are dipped in a batter, coated in panko crumbs, then deep fried. 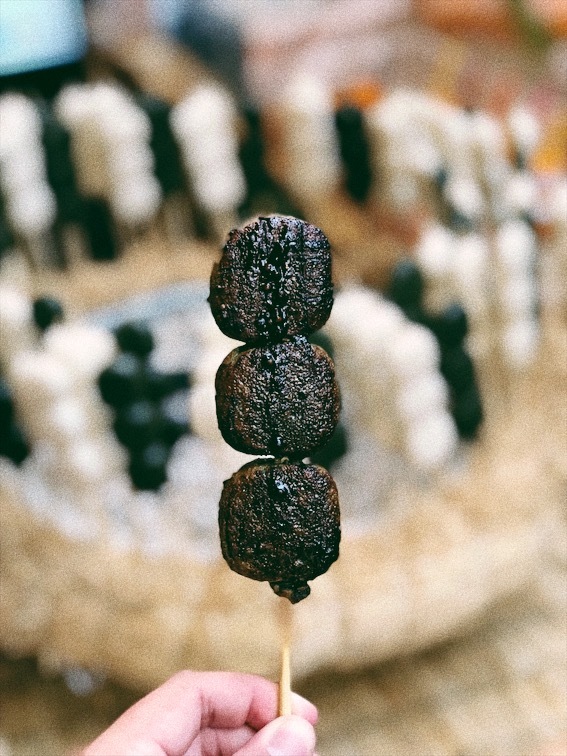 This Kushikatsu Daruma is a branch of the original in Dotonbori that has been around since 1929 and is a popular favorite! While a train station might not seem like a top place to visit on this Osaka itinerary you’ll be surprised at how much there is to do at Osaka Station. If you are interested in shopping we suggest visiting the Daimaru Department Store, LUCUA, Yodobashi Camera, and Hankyu Umeda Department Store . There are also quite a few green spaces to enjoy outside. The Umeda Sky Building has an incredible observation spot known as the Kuchu Teien Observatory which offers an unobstructed 360-degree view of the city. If you visit at day or night the view is spectacular and different. We enjoyed visiting at night in order to see all the city lights and trains rushing by. Shinsekai meaning “New World” was once a bustling entertainment district during the early 20th century, much like today’s Dotonbori. Be sure to stroll down the covered shopping area of JanJan Yokocho to hunt for bargains or stop at a pinball parlor. There are tons of inexpensive kushikatsu restaurants to dine at here as well. If you think you’ll have extra time pack a bathing suit and visit Spa World, a hot spring amusement park that offers many different fun attractions and places to relax. 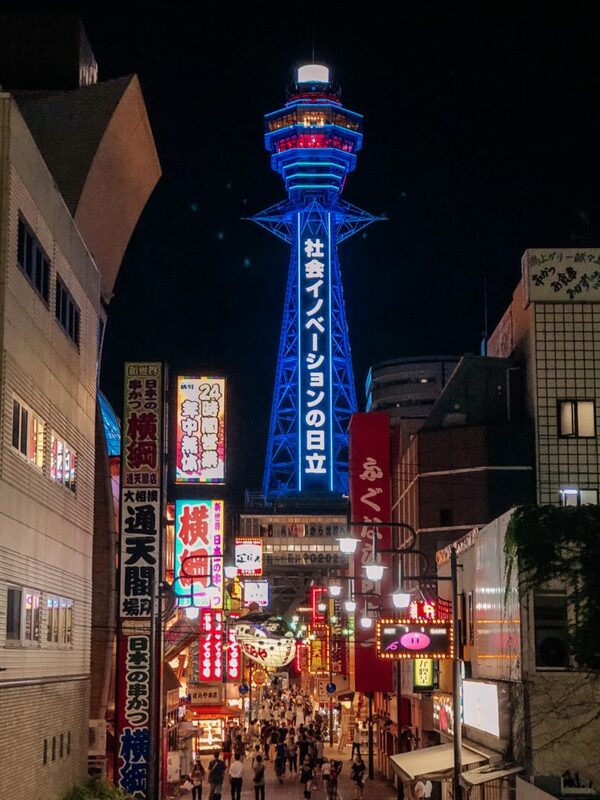 While visiting Shinsekai you can’t miss Tsutenkaku Tower. This timeless tower was originally built in 1912 and at the time, was quite an impressively tall tower at 64 meters (the tallest of the area for its time). After a fire destroyed part of the tower in 1943 it was taken apart to supply steel during World War II. It was later rebuilt in 1956 which is the tower you can see today. Don Quijote is a HUGE chaotic yet thrilling souvenir store that is sure to check something on everyone’s list. It has electronics, costumes, clothing, kitchen supplies and appliances, luggage, Japanese food items, beverages, you name it, Don Quijote probably has it and for an inexpensive price. This MEGA Don Quijote is one of the largest and most impressive we shopped at while in Japan. Even if you aren’t interested in shopping here, you could easily kill an hour looking around at all the crazy, yet cool finds at Don Quijote. Universal Studios in Japan is one place we haven’t been to that we are seriously bummed about. We love amusement parks and the fact that this park has Universal Studios and Harry Potter World is a huge plus. The only reason we haven’t went is due to the time of year we’ve always visit… summer. Summer in Japan can be brutally hot and while we were in Osaka the last time the temperatures were in the 100s! 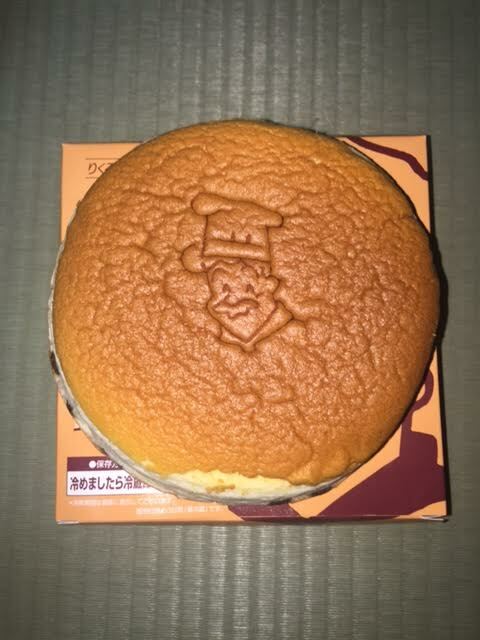 Rikuro Ojisan no Mise sells Japanese cheesecake which is a must try for anyone visiting Japan. Not to mention it’s very entertaining to watch the cheesecakes being made. Japanese cheesecake is very different from the cheesecake that you might be used to as it is more cake like and spongy. We bought one thinking that it would be a small cheesecake that the two of us could share but it was large enough to share with 6 other people! Even after visiting Osaka multiple times we always find something new to see or eat. We absolutely love this city! 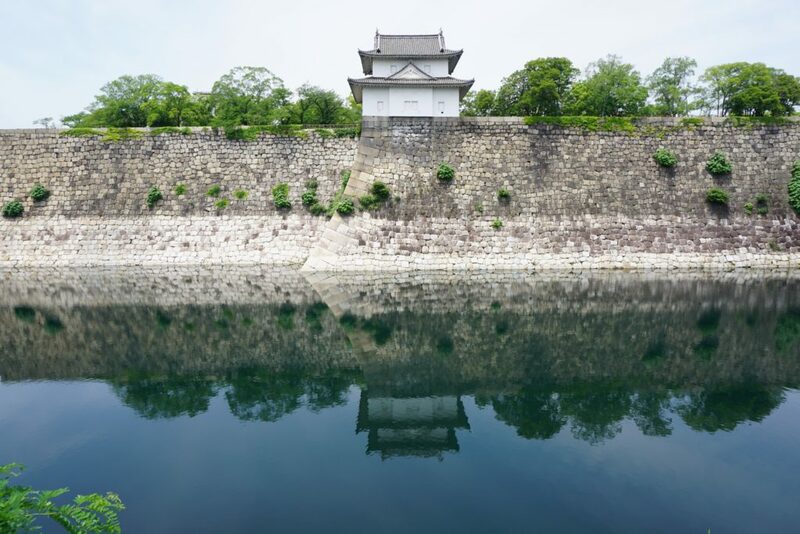 What are you most looking forward to doing in this Osaka itinerary? Wow, looks like you covered everything that Osaka had to offer! I visited there a few years ago but did not cover nearly as much. That Owl Cafe looks super cool. I’ll have to hit that up if I ever make it back to Osaka! 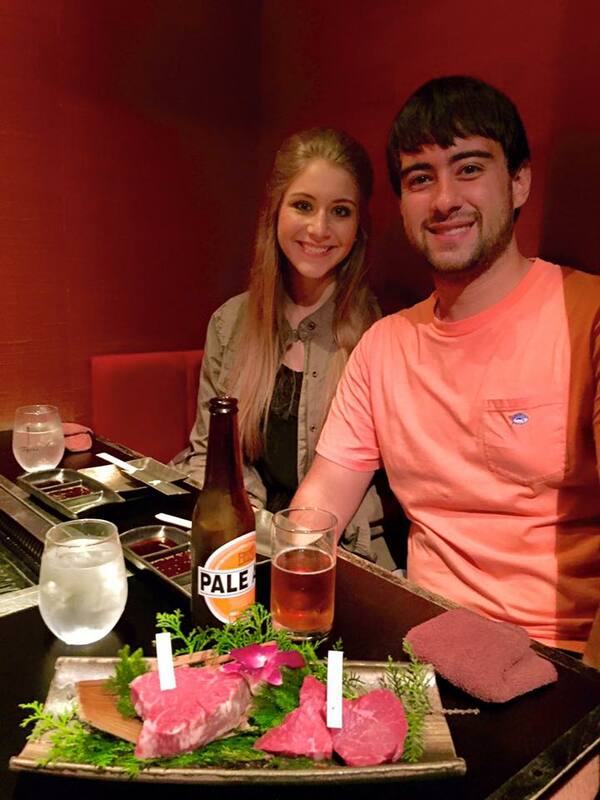 We love Japanese food as well, if you couldn’t tell! 🙂 Glad you enjoyed. The sightseeing places are as per my liking. And the accommodation looks cozy. But a curfew at 1am is really interesting. But I am glad discipline is expected from the guests. Did you try any vegan food while there? 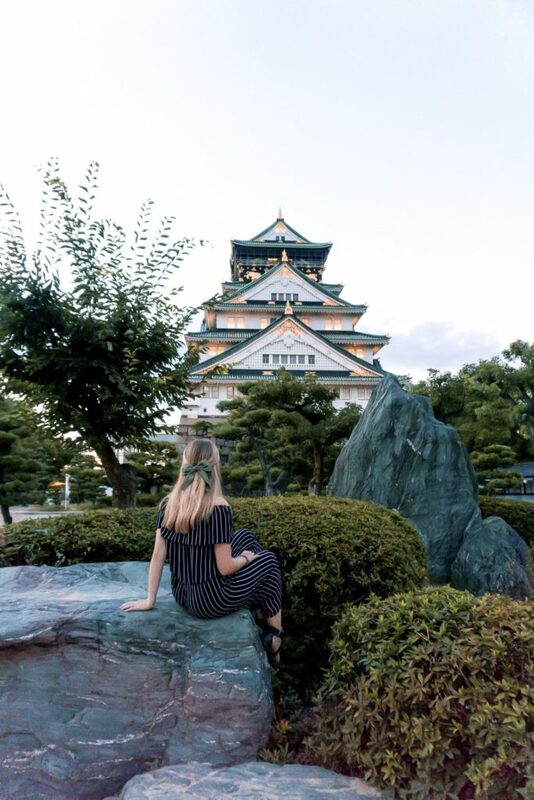 There was so much to see and do in Osaka! The curfew was a little weird for us as well but we never found it to be a problem as we were always so tired after exploring all day. I personally don’t recall trying any vegan food, however my wife Kallsy eats many vegetarian or vegan options whenever we are traveling. She too doesn’t recall a vegan restaurant in Osaka but tried a few places in Kyoto and Tokyo and loved them! Japan is high on my list. I have been reading a lot of blogs lately about Japan. It is just so unique and it looks as if your adventure was fabulous and you covered quite a bit. Thank you for all the details it helps for a future visit. Their culture of respect is very important so I can understand a curfew. Food looks tasty too! Osaka looks like both a traditional & modern city, I just the ryokan-style of accommodation. I went to a cat cafe in South Korea but I’ve never ever heard of an Owl cafe, that’s insane! Fun photos! I absolutely loved Japan when I visited a couple of years back. Unfortunately, I didn’t check out Osaka (though my parents did and they loved it). One of my favourite experiences in Japan was sleeping on a traditional futon and using a kotatsu (it didn’t mention you tried a kotatsu but if you get to experience it, highly recommended).